Verizon had an update recently, bringing the LG G5 software version to VS98713A and returning the coveted app drawer (released earlier by LG to carriers) that so many disgruntled LG customers were sad over. Yet and still, there’s one thing Verizon has failed to do: it refuses to bring support for the LG Theme Store (called LG SmartWorld) to let Verizon LG G5 users change the phone icons. The LG G5 Icons Guide is designed to help you do that. We’ve already shown users how to access LG SmartWorld in the event they can change themes on their devices (LG G5 icons included, not just wallpapers), but G5 customers on Verizon and AT&T specifically will have to take the following LG G5 Icons Guide to heart in order to change what I think is a hideous black/white/neon green toggle UI experience within the phone settings. So, you’re not really into downloading LG G5 icons from anywhere else. You’ve tried to download LG SmartWorld but it’s a disappointment. Verizon and AT&T are both playing hardball with LG, which means that those hideous icons aren’t going anywhere, anytime soon. Fortunately, what few users know is that LG also dropped a nice additional change in the update apart from the app drawer: you can actually change LG G5 icons without having to install SmartWorld or root your device. I started playing around with my LG G5 again after the app drawer returned in the latest update and, to my surprise, found that it’s so easy to change and customize LG G5 icons that you’ll be even more angry at LG for waiting to unroll this feature as well. How can you get it? It’s simple. First, download and install the new update. If you don’t have the software version VS98713A and at least the June 2016 security patch (06-01-16), then you need to install the new update by visiting Settings -> System -> System Updates -> Check for new system update. You should also be able to see the most recent updates to the device, which will tell you when you updated last. If you haven’t grabbed the latest update, do so. If you have, you can skip this step. Next, once you’ve updated, you can now go to the main page of your LG G5 and dig in. 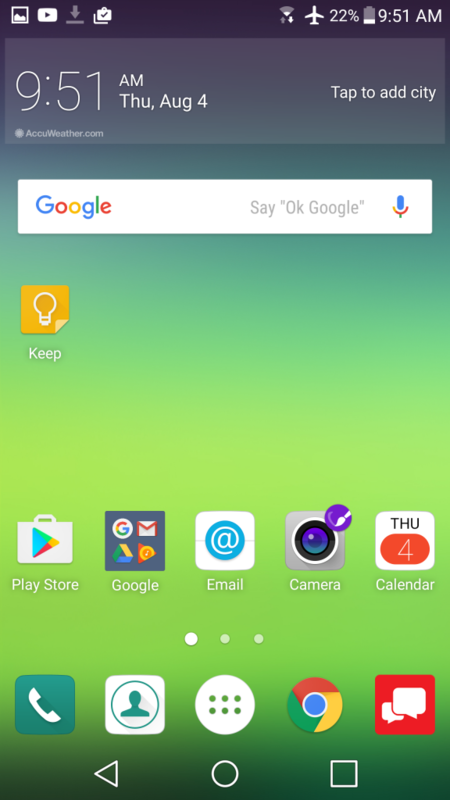 Go to the main page, where your LG G5 icons are placed. Tap and hold an icon until you see “uninstall” and “remove” options at the very top of the page. Then, release it without removing or uninstalling. At this point, you should see a purple circle with a white paintbrush appear. 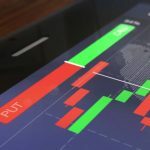 Tap the paintbrush symbol, and you should see a page appear titled “Icon change.” At this point, look beneath the top section and you’ll see a section called “Icon Gallery,” from which you can choose pre-installed icons. Choose from those if you’d like. 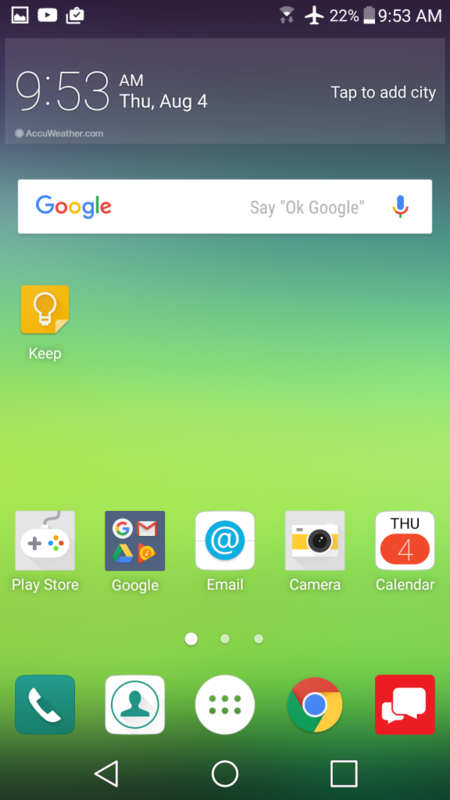 The LG G5 icons can also be changed by re-sizing an icon on the home screen. To do this, select “add new,” at which point you’ll arrive at a “Select Size” page that lets you resize the icons to be as small or as large as you’d like them to be. Notice that the camera icon, once a washing machine decoy, now looks like an actual camera. As for the Google Play Store icon, it now looks like a gamepad — which makes me like it a bit more than before. The photo gallery that was once reminiscent of the Nexus 7 from 2012 is now an envelope that makes you tempted to open it and “see the photos inside,” as photos are usually within an envelope before you take them out and show them to everyone. 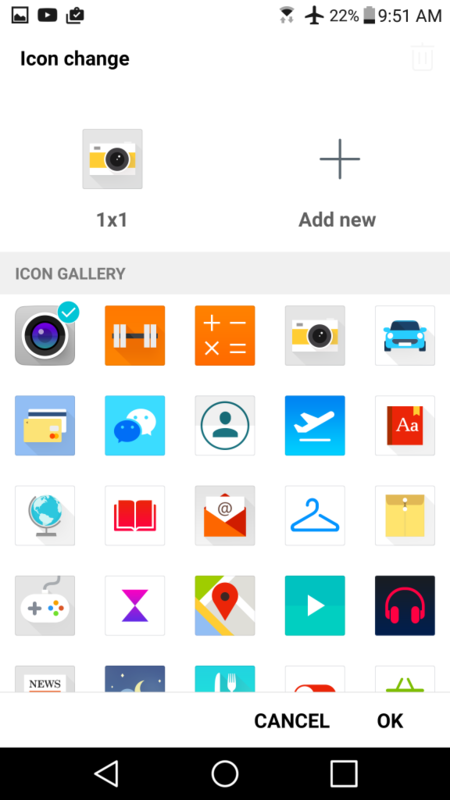 All other LG G5 icons adjustments can be made by other means, but LG’s method is already implemented, and it looks as if the OEM will continue to enhance this new icon gallery for G5 users. Take a look at our LG G5 icons gallery below to see the old icon look versus the new icons from the icon gallery.